Co. Armagh: Annaghmore, Armabrogue, Armagh (4), Ballyards, Ballymartrim, Brootally, Charlemont (2), Clady, Crossmore, Derrynoose (2), Glenaud, Grange, Hamilton's Bawn, Hockley, Keady (2), Killeen, Killyman, Kilmore, Lisnadill, Louhgall (2), Market Hill (2), Middleton (2), Richill (2), Tynan (2). The Board also included 12 ex officio Guardians, making a total of 49. The Guardians met each week on Tuesday. The population falling within the Union at the 1831 census had been 107,145 with divisions ranging in size from Killyman (population 1,950) to Armagh itself (10,343). 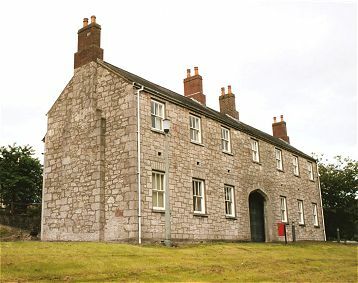 The new workhouse, built in 1840, was designed by George Wilkinson. It occupied a seven-acre site at the north-east of Armagh and could accommodate 1,000 inmates. The cost of the building was £7,200 plus £1,554 for fixtures and fittings etc. It was declared fit for the admission of paupers on 14th December 1841, and admitted its first inmates three weeks later on the 4th January 1842. The site location and layout are shown on the 1907 OS map below. Armagh entrance block from the south-west, 2003. 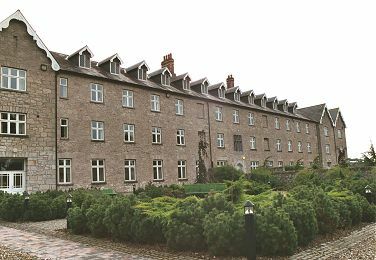 The main accommodation block housed the Master's quarters at the centre, and male and female wings to each side. Armagh main block from the north-west, 2003. Armagh main block from the north-east, 2003. Armagh infirmary block from the south-west, 2003. 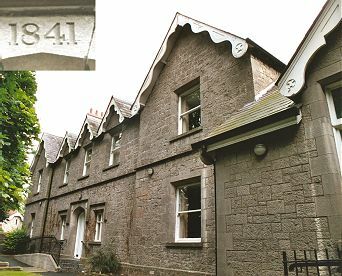 During the famine in the mid-1840s, a 40-bed fever hospital was erected at the east of the site. An additional 350 inmates were accommodated in: wards added over the dining-hall (100), sheds (100), new nurseries (50), and a hired extension to the fever hospital (100). Armagh fever hospital from the south-east, 2003. The workhouse burial ground stood at the south of the site. A memorial now stands at its entrance. Armagh burial ground from the north, 2003. At the 1901 census, the population of the Union was 46,856 with 17 officials and 233 inmates in the workhouse. The workhouse later became Tower Hill Hospital, now a community hospital. The entrance block, main block and fever hospital survive, together with part of the much altered infirmary block. Public Record Office of Northern Ireland, 2 Titanic Boulevard, Titanic Quarter, Belfast BT3 9HQ. Holdings include: Guardians' minute books (1839-1946); Dispensary minute books (1852-98); Workhouse registers (1843-1917. 1843-1904 available on microfilm); Admissions and discharges (1933-48);Indoor relief lists (1935-50); Return of births (1933-44); Outward letter books (1901-2); Masters' Journals (1921-48); Porters' books (1932-53); etc.